Executive high-back chair is ergonomically designed for your seating comfort and upholstered in stylish, durable leather. The lumbar moves with you to provide support in all sitting positions to avoid putting excessive pressure on your lumbar area. That feature is especially helpful when you're working long hours. 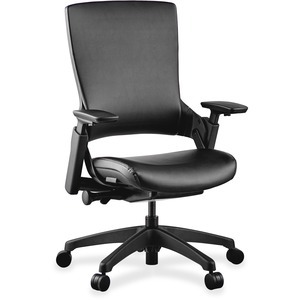 A special mechanism synchronizes back and seat movement so you can find the best position. The larger back tilt angles up to 35 degrees for all types of users and offers five locking positions with 7 degrees of adjustment for each. Use the control button hidden under the arm pad to adjust the arms in height, pivot and width.